Montmartre is a hill 130 m. high, in the north of Paris in the 18th arrondissement, a part of the Right Bank, primarily known for the white-domed Basilica of the Sacré Cœur on its summit and as a nightclub district. Because artists such as Dali, Monet, and Picasso had studios or worked around the community of Montmartre, it is considered - along with Montparnasse - the birthplace of modern art. In the mid-19th century artists, such as Johan Jongkind and Camille Pissarro, came to inhabit Montmartre. 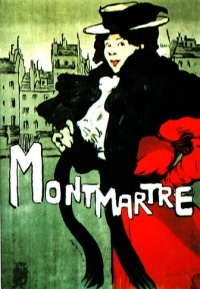 By the end of the century, Montmartre and its counterpart on the Left Bank, Montparnasse, became the principal artistic centers of Paris. The last of the bohemian Montmartre artists was Gen Paul (1895–1975), born in Montmartre and a friend of Utrillo, Paul's calligraphic expressionist lithographs, sometimes memorializing picturesque Montmartre itself, owe a lot to Raoul Dufy. When Napoleon III and his city planner Baron Haussmann planned to make Paris the most beautiful city in Europe, a first step was to grant large sweeps of land near the center of the city to Haussmann's friends and financial supporters. This drove the original inhabitants to the edges of the city — to the districts of Clichy, La Villette, and the hill with a view of the city, Montmartre. Since Montmartre was outside the city limits, free of Paris taxes and no doubt also due to the fact that the local nuns made wine, the hill quickly became a popular drinking area. The area developed into a center of free-wheeling and decadent entertainment at the end of the 19th century and the beginning of the 20th century. In the popular cabaret the Moulin Rouge, and at Le Chat Noir, artists, singers and performers regularly appeared including Yvette Guilbert, Marcelle Lender, Aristide Bruant, La Goulue, Georges Guibourg, Mistinguett, Fréhel, Jane Avril, Damia and others. Basilica of the Sacré Cœur was built on Montmartre from 1876 to 1912 by public subscription as a gesture of expiation after the defeat of 1871 in the Franco-Prussian War. Its white dome is a highly visible landmark in the city, where just below it artists still set up their easels each day amidst the tables and colorful umbrellas of Place du Tertre. Unless indicated otherwise, the text in this article is either based on Wikipedia article "Montmartre" or another language Wikipedia page thereof used under the terms of the GNU Free Documentation License; or on original research by Jahsonic and friends. See Art and Popular Culture's copyright notice. This page was last modified 20:37, 29 November 2018.